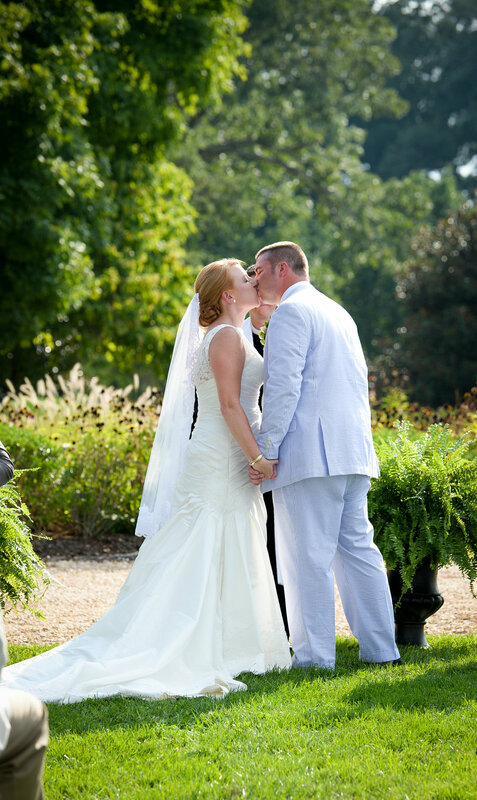 It was hard to believe that Saturday, August 30th, 2014 was finally here! With all the planning and visits from Randi & Justin, it was so nice to see their vision become reality. Randi is a horse loving Southern girl and wanted to add those elements to her wedding day. 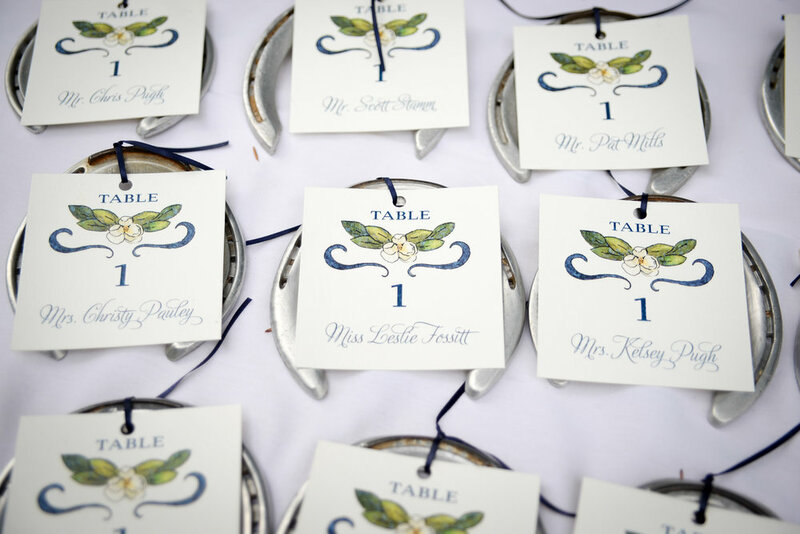 Justin spent days cleaning horse shoes for them to be used as seating assignments for the guests. On the back side was a saying about horse shoes and how you should hang them for good luck. Centerpieces had blue ribbons won from horse shows and on the buffet table was a horse made from greenery. Randi just loves magnolias so she had them incorporated into the centerpieces and her bouquet. I love how her florist used the magnolia leaves in her bouquet. 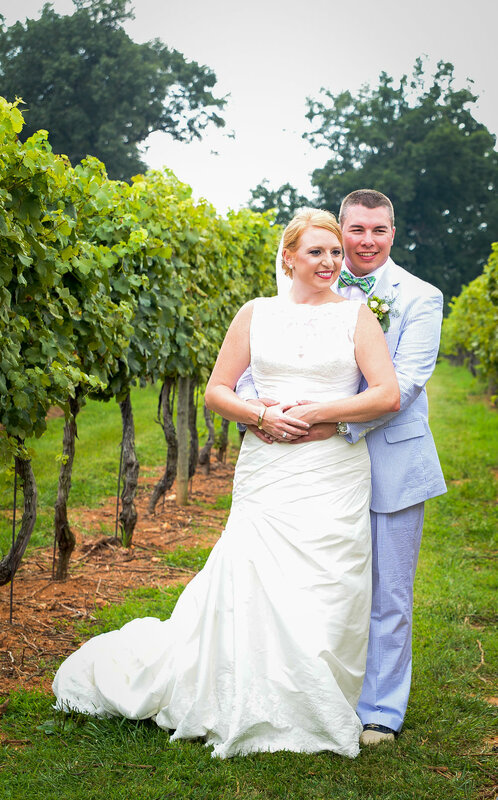 Randi & Justin chose a little different location at Edgewood Estate for their Charlottesville wedding ceremony to take full advantage of the beautiful view of the Estate, fountain, vineyard & mountains. So many fun things that Randi & Justin did to make this wedding so special. One of the highlights from the evening was instead of a traditional wedding cake, they had an ice cream truck! Guests just loved it (so did I!). We wish Randi & Justin a life time of happiness and thanks for sharing a dance with Brian! Thanks to the following vendors for doing such a fantastic job: Caterer Harvest Moon (their short ribs were out of this world! ), Day of Coordinator Whitney Abraham, DJ Andy Wilfong of Party Masters, Photographer Tyler Corvin, Verde Natural Florals, Officiant Bart Smith, Charlottesville School Board Buses, Sweet Tooth Ice Cream Truck, Skyline Tent Company, Make-up & Hair Artist Amanda Copeland & Carla Grace Semones. Click here to see photographer Tyler Corvin's blog.